BTRFS is a Linux filesystem which is sometimes used in ready-made NAS devices. Starting with 2013 NETGEAR switched to BTRFS as the main filesystem in their NETGEAR ReadyNAS devices. Synology NAS vendor uses BTRFS filesystem in some devices as well. BTRFS has many features like copy-on-write, checksumming, and creating snapshots designed to protect against data loss; however, you can still lose data, most probably to a software bug. 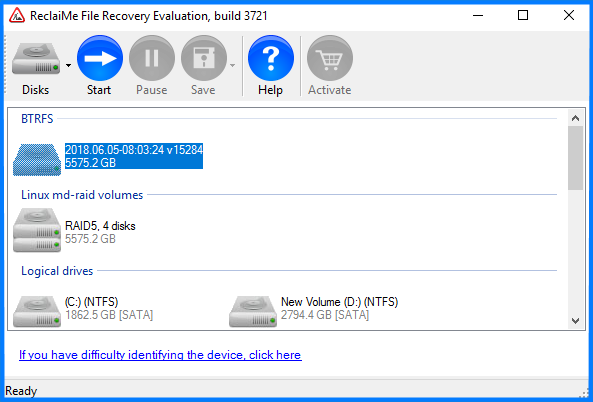 So, if you cannot access the data stored on BTRFS you can try to recover data using special data recovery software - ReclaiMe which is able to read BTRFS filesystem on Windows. Make sure you have enough free space on another storage or on a network to hold all the recovered data. Connect all the drives from NAS to a desktop PC, at the same time. Run ReclaiMe File Recovery software, select the BTRFS volume for recovery under the BTRFS section and click Start. The files are displayed as soon as they are discovered. In most cases you do not have to wait before the scan completes. Once you are satisfied with the BTRFS recovery result, you can start to copy data. BTRFS uses copy-on-write feature, meaning that when you edit a file BTRFS does not delete previous data, but writes changes to the new place instead. Because of this, file fragmentation is possible, slowing down file copying. The same copy-on-write feature also leads to another difficulty - the recovery time will be quite long, since the software has to analyze different versions of files and other metadata to choose the latest one. However, in the end the recovery quality tends to be fairly good.